At FiberPlus, we offer a number of different audio and visual services for your growing business. One of those services is the installation of audio/visual systems that support video conferencing. 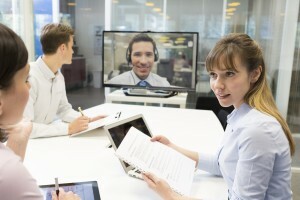 Video conferencing allows communication using an internet connection that allows participants to not only hear one another, but to see one another as well. While some businesses don’t believe video conferencing is beneficial for their business, others have quickly learned the benefits. Video conferencing allows your staff to make a more personal connection with clients without having to make the journey to see the client. In the past, in order to see a client face-to-face, some type of travel had to occur. Typically, a member of your staff would travel to the client in order to avoid inconveniencing your client, but traveling tends to cost money. Your business would then have to reimburse the staff member for any traveling fees they accrued over their time spent away. The time spent away from the office could harm the productivity of the individual because it would be difficult to complete other projects while on the road. Video conferencing allows members of your staff to see your clients without having to leave their desk. A personal connection is being made efficiently without the added expense and stress of travel. Being able to see the facial expressions, hand gestures, and overall body language of your clients can help your staff members keep clients happy more effectively. A large part of communication is through body language and that element is lost when using a phone or email. Video conferencing can also keep clients and staff connected should someone have to work from home. Life tends to throw us curve balls and sometimes making it into the office is just not possible. With video conferencing, you are still able to make the connections you need while working from your home. This entry was posted on Monday, July 13th, 2015	at 3:24 pm	. You can follow any responses to this entry through the RSS 2.0 feed. Both comments and pings are currently closed.